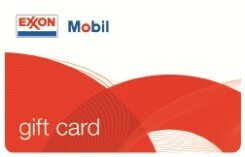 Use your ExxonMobil Gift Card at approximately 10,000 Exxon and Mobil stations nationwide; the card can be used right at the pump for the ease and convenience of filling up your tank; use it inside the station for snacks, beverages and convenience items, or while on the move stop in and get your car washed and or repaired. Exxon Mobil Corporation is not a sponsor or co-sponsor of this promotion. The Exxon and Mobil logos are registered trademarks of Exxon Mobil Corporation or one of its subsidiaries. ExxonMobil Gift Cards are issued and sold by SVM, an Illinois Limited Partnership.